At this point, Pershore Road climbed steeply up an embankment to cross the Worcester and Birmingham Canal and the old single-track Birmingham and West Suburban Railway, later used for a few freight movements. This view shows some interesting details of the trams themselves. The sunblind was drawn down to protect the driver’s vision and the leather-sheathed chain was in place across the driver’s platform – not always the case. The pneumatic starting bell was given from the rear platform by the conductor who pressed the plunger seen at the top of the bulkhead. A narrow tube connected with the driver’s bell beneath the stairs on the front platform. The elaborate life-guard can also be seen – the gate below the bumper was hinged and connected with the tray under steps, so that if anything struck the front gate it would rise, lowering the tray which would pick the obstruction up. Also visible is the disused ‘Board of Trade’ light at high level, left of the sun-shade. 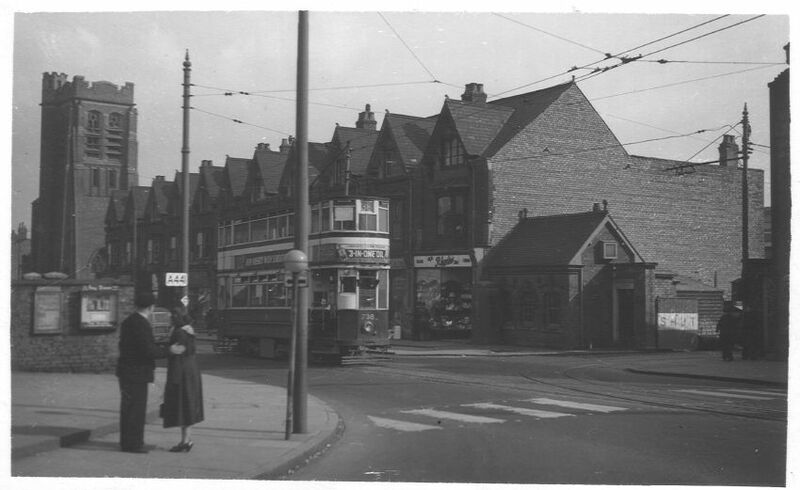 Tram in the heart of Cotteridge, 1952. Note the conductress from the tram has the trolley rope in her hand as she prepares for the tram to change direction. Also, note the bobby on his bike on the far right hand side. The conductress seems to have been quite nippy turning the pole at the terminus, as passengers were still getting off while she was half way round. Like trams 732 to 811, the body of the Leyland PD2 Outer Circle bus 1729 was also built by Brush at Loughborough, but 25 years or so later, and the bus was based at Wellhead Lane garage, Perry Barr. A photo from the opening of the tramway on 23 June 1904 shows the properties on the left as houses with shallow front gardens, but they were soon converted into shops. Looking towards Pershore Road from Watford Road, with St Agnes Church visible. The driveway to the right of the picture leads to the former bus depot, but the tracks leading that way show it was a tram depot before that. Until a small depot at the terminus was finished, the eight cars needed to run the service were housed at Bournbrook depot, but this was only for a few days, as the new depot opened in early July 1904. The gable-roofed shed ran parallel with the main road, and the four tracks converged into a single track at right-angles to the road which then forked left and right to meet the single running track in Pershore Road. 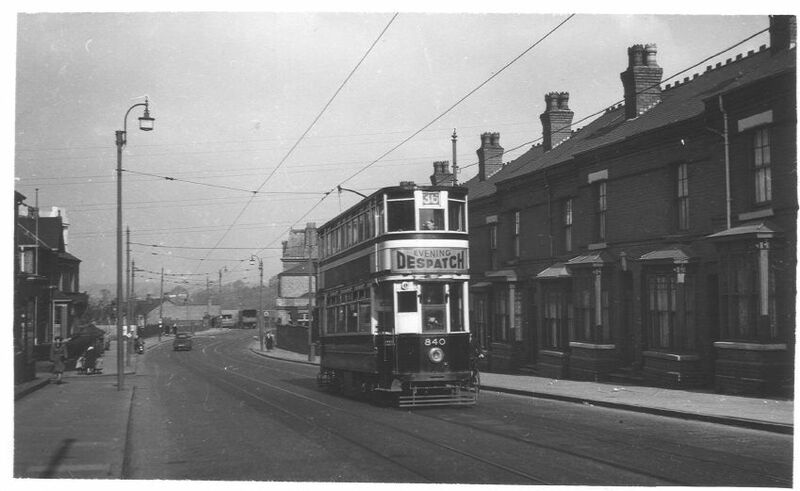 After City takeover in 1912, the depot was used only for storage, the tram route being operated from the Bournbrook depot in Dawlish Road. 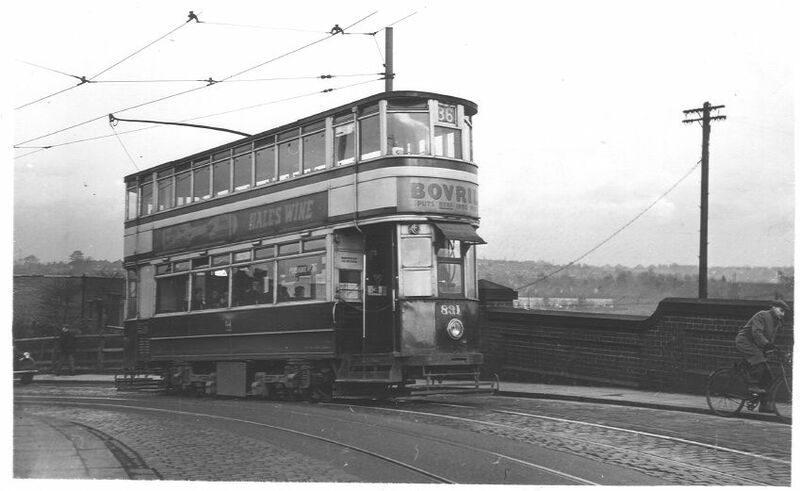 During the 1920s, the Bristol Road tramway was extended in stages from Selly Oak to Northfield, Longbridge, Rednal and Rubery, cars still being provided by the Bournbrook depot. The Cotteridge depot was widened in 1922-23 from 4 to 8 tracks, and extended in length to give a total capacity of 30 cars, and on reopening it was provided with some brand new standard Birmingham Corporation bogie cars. The depot was then able to relieve overcrowding at the Bournbrook depot with its capacity of 46 cars, until this was replaced by the new depot at Harborne Lane, Selly Oak which had room for 80 trams in addition to buses. An interesting feature of the Pershore Road route was the pair of lightweight experimental cars built in 1929-30, the last to be acquired by the Department. When Short Brothers tendered to build bodies for cars 812 – 841, they were required to produce virtually a facsimile of the previous batches (indeed they took car 740 to their works at Rochester for a few weeks to make sure they did so) but , having expertise in aircraft and lightweight bus construction, they offered to design a modern lightweight tram conforming with most Birmingham requirements. This was delivered in October 1929 and placed on lightweight trucks by the English Electric Company, and entered service the following month as car 842. It had a few teething troubles which were corrected in the early years, but the car remained in working order until 1952, and was driven to Kyotts Lake Road works to be broken up in July 1952. It weighed 13.6 tons, compared with the standard car’s weight of 16.8 tons. Wishing to be in on the act, the Brush Company offered to design and build their version of a lightweight, which they delivered to Birmingham in June 1930, and mounted on special trucks by Maley and Taunton with GEC motors and controllers. This car weighed only 12.3 tons, and entered service as car 843 in September 1930, but it remained a regular visitor to ‘The Lake’ (Kyotts Lake works). . 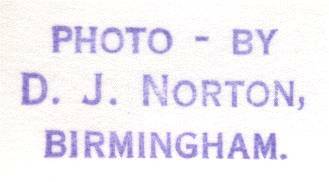 It was closer in appearance to earlier Birmingham cars, but its domed roof made it particularly handsome. It was taken to Kyotts Lake works in January 1952 after one motor failed, and remained there awaiting scrapping with the other Pershore Road cars that July. Would any of these depots be the one by Selly Oak Road? 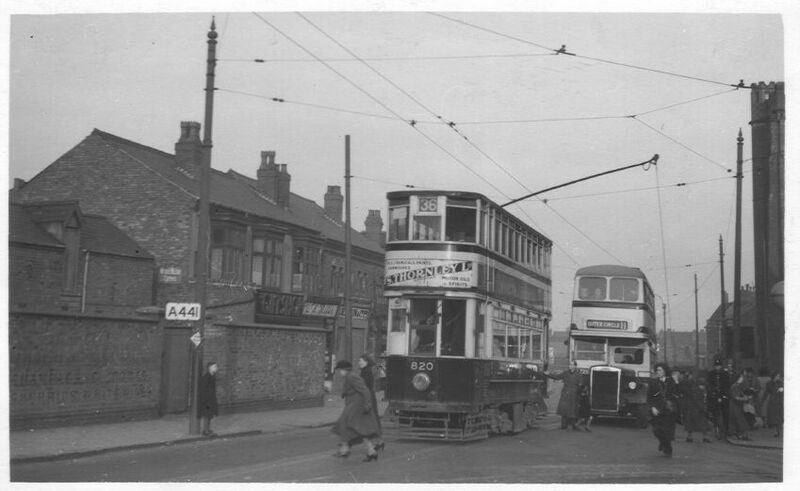 The directions I have from my Uncle now in his eighties is that the garage was in Selly Oak and the tram depot was further along on the left. The garage was owned by one person, as of 1938/39. I will try and get him to give a better location. The second photo on this page is the exact location of a terrible tram and bus accident in 1947.